This painting represents the Mysore traditional style of painting with modern touch. The background of this painting is fully covered with texture. 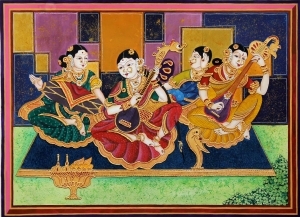 The jeweled depiction of Lord Krishna and Gopis is done exactly like in a Mysore traditional painting.